I realize this is quite the Bucket List, but there is so much in this city we have yet to explore! I thought it was time to make a list of everything we'd still like to do. This way, on those rare weekends we have nothing going on, this can provide inspiration. When the time comes that we no longer live in San Francisco, I don't want to have any regrets. I want to feel like we took full advantage of living in such an amazing place. A few of these things we've already done, so I marked those in italics. I wonder how long it will take us to complete everything? 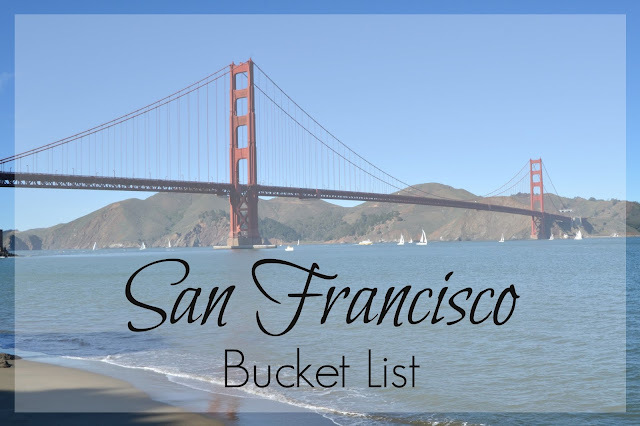 You can see my original San Francisco Bucket List post here. It was one of my very first blog posts! I'm heading your way next week and this post just increased my excitement level even more! It definitely seems like there's lots to do/see!! I would add the Alemany Farmer's Market, the botanical gardens (free with an SF ID), Tosca, Specs, Mission Dolores, ballet, opera, and symphony.